Get a comprehensive tour of Alcudia in an open-top bus during this 1.5-hour excursion. See the city's most important sights and landmarks while listening to live commentary from an on-board guide. Multiple departure times throughout the day; pickup and drop-off at select hotels available. Begin your Alcudia tour with pickup at your hotel; alternatively, make your way to a central meeting point. Departures are available at 11am, 1pm, and 5 pm from Port de Alcudia, Playa de Muro, Las Gaviotas and Can Picafort. 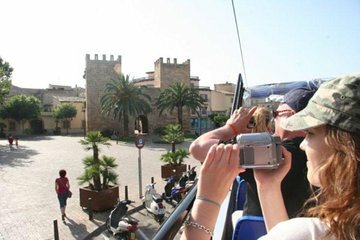 Find a seat on the open-top bus and enjoy the sunshine while taking in the most important sites of Alcudia during the 90-minute route. Listen to informative commentary from your guide as you travel past the Port, the bullring, the 14th-century church, the Old Town, and the Roman Ruins. Return to your departure point after 90 minutes.